Moving? Remodeling? Need more space? 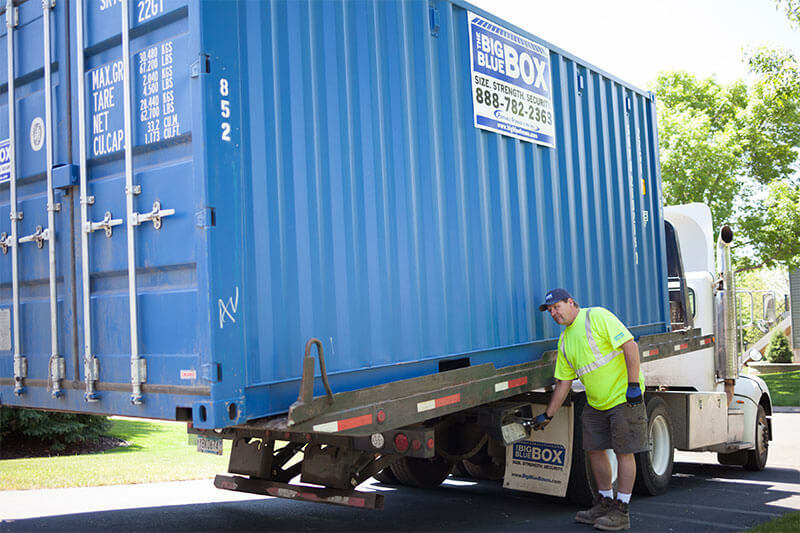 The secure, weatherproof portable storage containers from Big Blue Boxes are your solution. Not only do we deliver storage containers to your door, but we will come and pick them up once you’re done with them. We are committed to providing you with storage units that you can rely on for security and durability. Our units come in a variety of sizes, so you can get something perfect for your needs. Big Blue Boxes delivers anywhere in the state, regardless of if you’re in downtown Milwaukee or a dairy farm in the middle of rural Wisconsin. We deliver our units from any of our hubs to any house in the United States. If you want fast delivery and low shipping prices for your business or event, Big Blue Boxes is your best solution. Need a long-term storage solution? Buy our containers today! Moving can be a hassle. Make it easier with Big Blue Boxes. Ready to get your first storage unit and get started? Get 25% off your first storage container delivery when you order a 20’ container for a minimum of 3 months. Ready to Get Started Buying or Renting Portable Storage Containers in Wisconsin? No matter your portable storage container needs or where you’re located in Wisconsin, Big Blue Boxes is your best solution. View our pricing options today!